Forums » General Discussion » Technical Questions » What's wrong with my M60v2? #426940 - 11/06/17 02:15 AM What's wrong with my M60v2? what could be wrong with my M60v2? Is it tweeter or crossover? My suggestion is to swap it from the other speaker and listen again. Now if its still sounds the same try the original in the other speaker ie swap left to right and see how the other driver sounds,this will help determine if it is the driver or the crossover. could just be a loose wire inside as well. time for some detective work. Like Socketman said. I would undo the screws on the tweeter and check the connections. it is simple to do. if they are secure on both the speaker driver end and the crossover then you can investigate a bit further. Has the speaker fallen over or taken any sort of damage? I had a cat attack a speaker once and nocked it over. It gave a simular sound. turned out that the crossover board got wacked by the magnet from the back of the woofer and cracked. it was one of the printed circuit board leads that was damaged and just needed to get heated up and a bit more solder added. You didn't say if it was both the speakers doing the same thing, or just one speaker. if it's just the one, then you can try swapping the tweeter on one speaker with the other. if that fixes the problem follows the speaker then you'd have your answer. When i first got my M2's i had a strange noise coming from one of them. Axiom sent me a new driver but in the interm i discovered that the tinsel leads on the back of the midrange were rubbing on the cone. Ok, so it turn out it's my Emotiva XPA3 is the one causing the problem. I use the other speaker to test and it came out with the same distortion. Switched the power channel that used to power my center to power that left speaker, everything were OK! wasting my time taking off the tweeter, swapped them, run test, bringing down the other speakers from my living room, sweating like hell and it's the amp problem! Interesting... glad you found the problem though. I guess that follows the usual rule of thumb - "if equipment needs to be moved, the problem will be in the heaviest component". Sounds like an upgrade opportunity. Glad to hear you worked things out, sorry to hear its your amp though. I cant imagine what it would cost to send that back to Nashville from your locale. Emoitva is pretty good to deal with , i would give them a call if it is still under warranty. 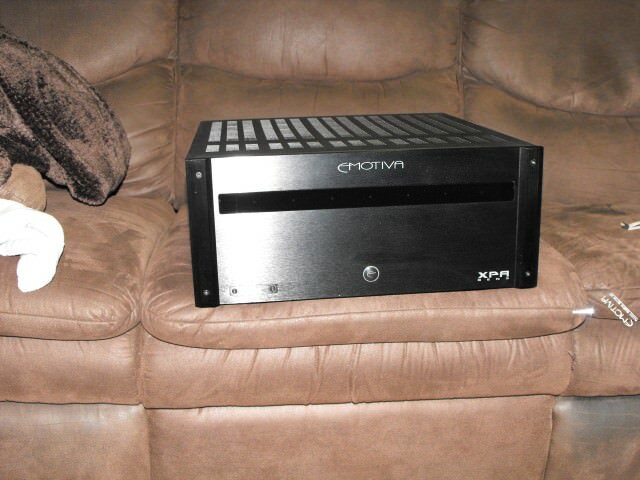 the Emotiva is powering my front LCR, I am using the Denon X6200 to power the Center now. Still enough to run my 7.1.4 setup. ..."always have a spare channel or two of amplification"